It’s been a lot of fun these last few months getting out and about to do more hunting and gathering for mid-century modern furnishings and larger accessories to fill the new booth at the Louisville Antique Market. 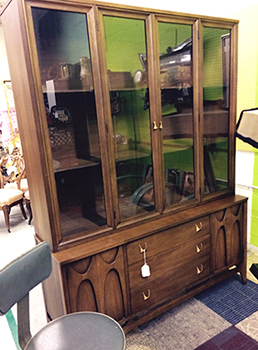 I am pleased to offer a few pieces of Broyhill’s hot Brasilia line – a large china cabinet and four dining chairs. Broyhill brought a liveable modern to middle-class America in the 1960s with it’s Brasilia line by drawing inspiration from the (at the time) new modernist architecture of Brasilia, Brazil. The 6140-62 Breakfront Base topped with the 6140-61 China Deck, or the large China Cabinet. The base measures 56″ x 28″ 17″ and features three drawers and two side doors. The drawers feature the signature Brasilia designed pulls and the doors feature the same designed relief in the doors. The china deck above features two shelves with two doors and an all glass front, to display your mid-century modern dinnerware. Both pieces are solid walnut and while they are separate, the top is secured to the base with screws. 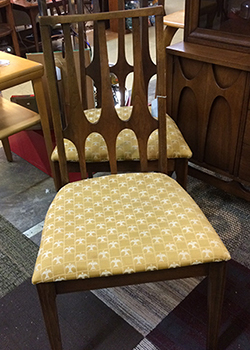 From the same estate, I also procured four dining chairs (model no. 6140-81) with the original gold fabric, which features a repeating Brazilian stylized dove motif. The china cabinet is offered at $1495 and the set of four chairs is offered at $595. Follow us on Facebook and receive exclusive discounts on any item in the Decorama Vintage Modern booth at Louisville Antique Market, including these pieces. The Louisville Antique Market is located at 845 E. Jefferson Street in the NuLu District in Louisville, Kentucky, and they are open daily from 10:00 a.m. to 6:00 p.m. This entry was posted in antique mall, collecting, mid-century modern and tagged brasilia, louisville antique market, midcentury modern.